This week, the Underground Gourmet recommended unique summer treats across the city. Elsewhere around town, Ryan Sutton dropped a single star on Gato, and Pete Wells fell back in love with the River Café. All that and more ahead. 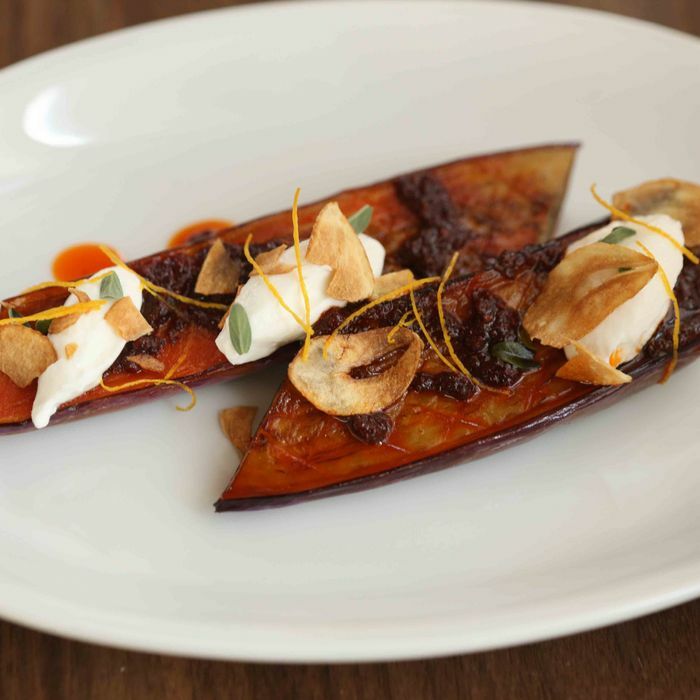 Alan Richman paid Bar Bolonat a visit, and greatly enjoyed Einat Admony’s Israeli-Mediterranean cuisine. He loved the Japanese eggplant with sheep’s yogurt and aleppo-pepper vinaigrette, a firm and sweet dish worth its $11 price tag. While the grilled baby artichokes were a misfire, the poussin (best if shared) and the beef kibbeh make it worth a trip. Two stars. The New Yorker sent Shauna Lyon to Navy this week, where she found the food enjoyable but uneven. She recommends lunch over dinner. The fresh raw greens liven up any dish they’re on, and the skirt steak with potatoes (creamy and crunchy) was a treat, as was the crispy-skinned tarragon chicken. If you stay for dessert, turn your eyes towards the simple baked pear with yogurt and granola. Zachary Feldman also made a trip to Gato this week, but he was more effusive in his praise than Sutton. He thought the softshell-crab crostini and the octopus in tangerine sauce were standouts, and especially enjoyed the crusty soccorat at the bottom of Flay’s kale-and-mushroom paella. Steve Cuozzo also reviewed Bustan, giving it two and a half stars out of four. He thought the flatbreads were a noticeable weak link, but the charred octopus and the Middle Eastern potpie with lamb were standouts, the latter “fervently spiced.” Halvah makes its mandatory dessert appearance in the silan, a sundae layered with puffed rice and hazelnuts. It’s a decadent way to end the meal.